Indianapolis, IN (November 2017) – Jenna Corcoran, assistant director of IUPUI Student Employment Services and Assessment in the Division of Undergraduate Education, is the 2017 recipient of the National Student Employment Association’s (NSEA) Margene Orzalli Memorial Award. Corcoran received this award at the NSEA 2017 Annual Conference held in Virginia Beach, Virginia, in October. 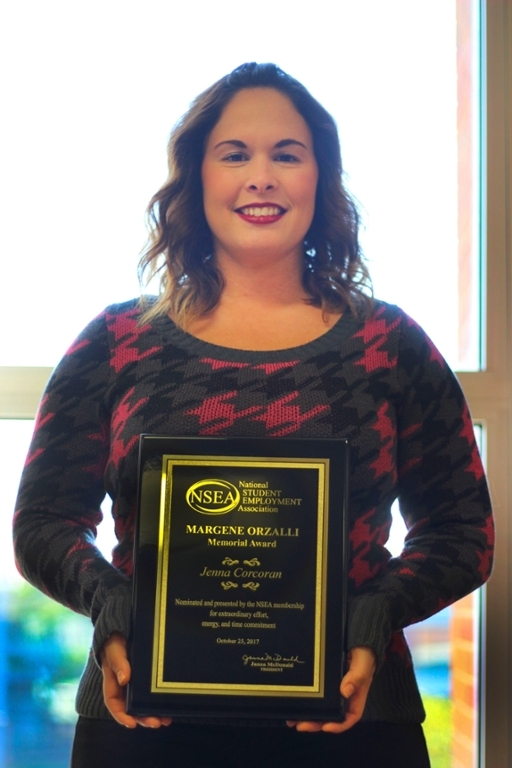 The Margene Orzalli Memorial Award is granted each year to a member of NSEA who demonstrates extraordinary effort, energy, and commitment. The recipient provides leadership and vision through various activities, including committee work, conferences and programs, and leadership positions as an officer or director. Corcoran has provided over two years of service to NSEA through her work as editor of the Journal of Student Employment. Her energy and efforts revitalized the once dormant publication, and the organization is now proud to have it represent the efforts of colleagues around the country. NSEA looks forward to seeing the publication continue to develop and to grow due to Corcoran’s efforts. In addition to receiving this award, Corcoran was elected to serve as vice president of membership and marketing for one year starting in January 2018. The National Student Employment Association is a comprehensive student employment association with several hundred members involved with programs for college students who work. Membership is open to anyone with an interest in administering student employment or hiring students. NSEA supports and promotes student employment through research, publications, professional development opportunities, and the open exchange of information.